“Fece al Baviera in disegni di stampe, tutti gli dei, itagliati poi da Iacopo Caraglio alcune, quando Saturno si muta in cavallo; e quando Plutone rapische Proserpina.” The same appears very little altered in Vasari, 1568, II, 207-208 (Vasari-Milanesi, V, 162). Baviera (Baverio Carrocci di Parma), was, according to Vasari (Vasari-Novara, 1967, IV, 90, V, 193-194), an assistant to Raphael whose occupation for many years was the grinding of colors and who attended to the printing of Marcantonio’s plates engraved after Raphael’s designs. 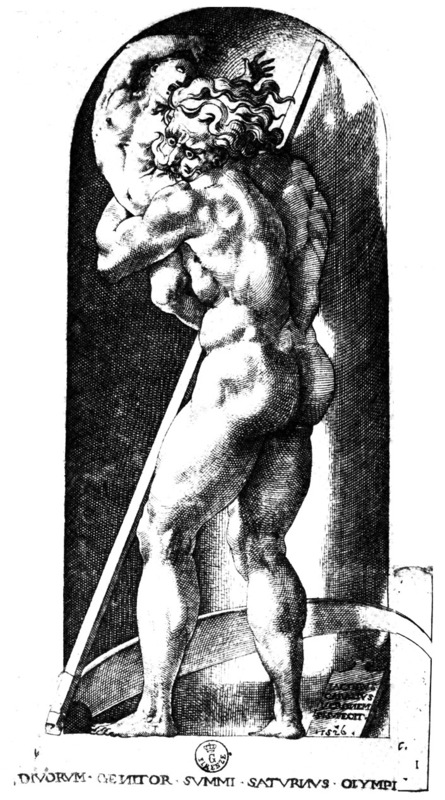 None of Caraglio’s prints after Rosso’s designs bears Rosso’s name and only the first (Fig.E.26) of the twenty Gods in Niches bears the engraver’s. For a short but full biography of Caraglio, see Archer, 1995, 73-75, followed by a catalogue of Caraglio’s engravings from Rosso designs, 114 ff., accompanying the plates in Boorsch and Spike, IB, 28, 1985.